The Media Recorder API is the new HTML5 API for recording video in the browser. With Firefox supporting it for at least 2 years and Chrome having implemented it at the beginning of this year, we wanted to see just how many Internet users can actually use it, if, as a developer, you decide to implement video recording in your website using this API. We just had to find the exact versions that supported basic audio and video recording and measure the market share of those browsers against a large dataset. Chrome 49 is the 1st version of Chrome that implemented both audio and video recording using the Media Recorder API. Chrome 49 was just released 2 months ago on the 2nd of March but because of it’s automatic update system, just a small amount of users still use an older version. Chrome is now at version 51. Chrome 49+ can record both VP8 and VP9 video (with H.264 coming in Chrome 52) and it uses Opus @ 48kHz for audio. Firefox supports the Media Recorder API since at least version 30, released 2 years ago on June 10 2014. Firefox 30 is the 1st version we managed to get both audio and video working properly. Firefox 30+ uses Vp8 for video and Vorbis @ 44.1 kHz for audio. Internet Explorer, Edge, Safari and Opera have not implemented the Media Recorder API. Unfortunately the Media Recorder API is only supported by Chrome for Android. That’s one of the reasons in this article we’re only measuring the desktop browsers that support the API. Stats are based on aggregate data collected by StatCounter on a sample exceeding 15 billion pageviews per month collected from across the StatCounter network of more than 3 million websites. We’ve also considered W3Schools’s Browser Statistics but the data set is much smaller and the user base is skewed towards technologists who might install more than the default OS browser. We’ve chosen the entire month of May because it’s the largest recent data set that’s easily comparable against other data from other sources and other months. May is also 2 full months after Chrome’s 49 release on the 2nd of March. The generated chart image only shows the 1st 12 browser versions but the .csv file contains detailed market share for 167 browser versions. So we’ve imported the .csv file into Google Sheets and isolated the market share of Chrome 49+ and Firefox 30+. You can review the spreadsheet here. 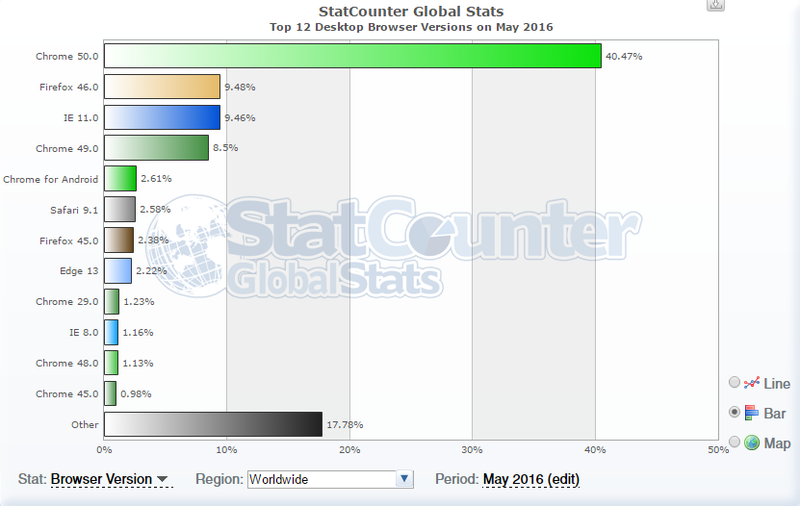 65% of the desktop page views in May 2016 were requested by browsers which supported the Media Recorder API.